Being a Christian at school is tough, even more so at a public state school. One way to be encouraged at school is to be part of a lunchtime ISCF (Inter-School Christian Fellowship) group. I’m going to be leading on a conference in the first week of these upcoming holidays. We want to train up leaders for our schools. Student lunchtime groups work best when the crew step up and lead. I work at Barrenjoey High and we have a lunchtime group called Chips and Jesus. I would love to have some solid crew for leadership but we are still a year or two away from that happening. But I want to start setting up some of the crew there to see their leadership potential. Therefore I’m looking forward to seeing other student leaders in action and to learn from them on this week away. 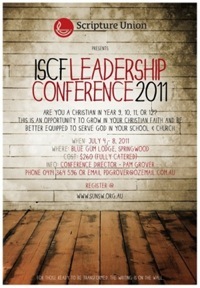 Tell anyone in year 9-12 who should come to come. For more deets check out the SU site here. I’m excited about this Friday! We are hosting a music event at our church for the youth community to be part of. 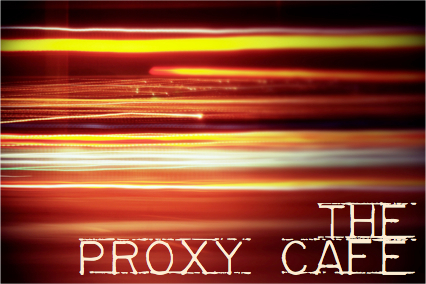 The Proxy Café is a place for the youth of the peninsular to come and enjoy local talent in a relaxed setting. We want to represent (hence proxy) the local creative community and also the local Christian community and partner together to support them and give the opportunity for young people to share their God given gifts. This first event is a bit of a test for the idea and hopefully we can further develop the idea into a regular event and partnership. @ Keen Hall (1 Kevin Ave, Avalon). I enjoy music, but sometimes I don’t enjoy music when I’m at church, this isn’t because the band is bad, but often because the songs are boring musically. I know I could start a whole debate on worship wars and that’s not my intention in this post. Joe Day (52 Songs guy) from Mars Hill Church in seattle has produced an album, Grace, that I personally enjoy. It is musically interesting and theologically dense, with many songs being old school hymns, and while I admit that performing these songs may not work within some congregations, it does well to push the envelope of what we consider to be ‘worship’ songs. My favourite song on the album would have to be the opening track, Death to Life. It is a poignant reminder of how Jesus has saved us from death and given us life. As dead people we are unable to save ourselves and need a saviour to bring us life. This is all by grace. The other reason I want to share is that you can get it for free from Noisetrade. You cant get much better than free and if you don’t like it you only got what you paid for! In the last week I have spent some extra time considering the role of technology and social media in our culture. Part of this started after seeing the documentary Catfish (I don’t wish to spoil it if you haven’t seen it) which highlighted the issues that social media can raise. Mark Sayers has also posted some recent musings over at his blog about social interation online and how Christians should use it. In addition to this Tim Challies is about to release a book about technology, below is the trailer for his book. It is very thought provoking. One of the worship pastors at Mars Hill, Joe Day, has set himself the task of writing a song a week this year. Quite ambitious if you ask me. But it’s good to hear what he has come up with and the way he also talks about the creative process of writing them. Check them out at One Year, 52 Songs. The last one he wrote was for Valentines Day. How sweet. Destructor: Ever since I first heard this song over 4 years ago I have loved it. A much tighter statement of Jesus’ propitiatory work on the cross, taking the weight of God’s wrath upon sin on himself. So check the song out, its free and check out some of the other songs they have to offer too. Below are the lyrics in full. Who will not fear you oh Lord? While we are all shocked right now at the severity of the Queensland floods, today is the 1 year anniversary of the Haiti earthquake. I want to support our fellow citizens in Queensland but also want to support those who have no decent infrustructure to rely on and are feeling the effects of corruption. I’ve heard that much of the support that was pledged for Haiti has not been followed up and received, especially from other national governments. One organisation that I want to promote and support for their work in Haiti is Churches Helping Churches. One of the resons I wish to suppot them is the way they are planning to use the money in the country. In an article on how they are and aren’t giving money they explain how they are teaching the local Haitians to own their infrastructure rebuilding process and not just receive free handouts that are not well used. One key, experts have said, to Haiti’s recovery, would be for the international community to not blindly pour money into a country that would not be able to properly channel it into infrastructure development; The key would be for Haitians to own and implementthis recovery. The whole article is worth a read to see how they are working through the church not just to erect buildings but to create growing and supportive church communities. The church is the people not the building. I want to leave you with their latest video update. Please consider how to support the Haitians one year on from the disaster that affected them and also pray for the churches there. With this in mind pray also for the Queensland floods and how you will support these people too.